Turn your heating on and wait for the radiators to get hot. This will help you determine which radiators require bleeding. Those with ‘cool spots’ or that don’t heat at the top will be the ones you need to concentrate on. Turn off the heating. Wait awhile until things cool down a little. 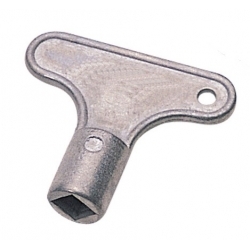 To bleed the radiators you will need a good quality radiator key such as the one below. Do not use the style shown below. Lay down a sheet or towel under the radiator where you are working. At the top of the radiator on one end is the radiator vent. You need to attach the radiator key to the square bit at the centre of the valve or insert the flat ended part of the screwdriver into the groove. Keep a clean cloth in one hand near to the vent, hold the key or screwdriver and slowly turn anti-clockwise. you should start to hear a hissing sound, this is the air escaping. Once water starts to escape, close the vent by turning the key or screwdriver clockwise. Do not fully unscrew the radiator vent grub screw! 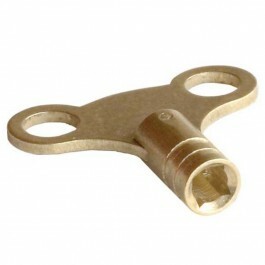 If the valve itself starts to turn, tighten it up and then hold it in place with a spanner. If you have a combi or system boiler or your heating system is pressurised, you may need to ‘top up’ the water pressure in your heating system.. You can do this with the relevant taps at the boiler or the lever valves at your filling loop. (please refer to boiler manufacturers instructions). This entry is filed under Boiler Care and tagged air, bleed, radiators. « Know your Oil Boilers!